It’s not properly rubber, mind you. It’s types of plastic and foam, but it’s there, it’s a thing. It’s stuff and that stuff moves around and has weight to it. I love this, and part of why I love this is because you can kick a person wearing rubber in the chest. There’s a lot of full, moulded and defined suits in this series. The monsters typically are wearing a lot of weight, and when they get kicked, they can show you the point of impact. Fights can have multiple shots from multiple angles, and reactions can show a figure realistically staggering backwards, rather than being animated falling backwards. The lack of animation is a big deal! Animating realistic movement in response to a 3d physical object is realy hard, and that’s why the movies and shows that do it often have truly ludicrous budgets. When you’re wearing a rubber suit, though, you can’t show off a lot of flexibility and physical movement – you have to do all your expressiveness through posture and position. Characters who don’t get to show mouths or even eyes have to convey everything about how they feel and think by the position of the whole body, and that calls for a very particular skillset. Thankfully, thanks to the suits being, themselves, physical objects that conceal the actor, you can have one or two actors do the work of every monster in the series, and that means that you can have those same monsters played by people who are really good at playing monsters, instead of having to find a new actor every time who can pull off the physicality of the role. This plays into the reality of the series. Everything that can be a physical object is better off being a physical object. Phillip’s mindscape, for example, is pure nonsense, a CGI library of swiftly-animated nothing that you don’t get to look at too closely. Yet at the end of it, he picks up a physical prop. When his mindscape is invaded by other people, they actually go there and there’s a moment of two actors in the same room of library books. The powers are connected to objects, the heroes have physical things that do things like follow people or block attacks, and even enemies with unreal powers still have a sort of physicality to them. This, by the way, I joke about as it regards to Playsets And Toys. These physical objects allow for storytelling through those objects. When a dopant is defeated, they smash the usb drive and show it, on the ground, surrounded by flames and smoke. A background object like a statue becomes important to the plot, an enemy who’s a special ghost car is actually there and it’s an actual car (most of the time). There’s also the way the Gaia Memories being ports let you add an element to every dopant character design: They all had their Gaia Memory and the port they inserted it, and that meant you had a moment of transformation where they got to ‘apply’ the object to themselves. Some characters had well hidden ports, some had them in really obvious places. For some Dopants, they transform while looking you in the eyes, others hide their ports somewhere under their clothes. The whole thing adds an element of choice to someone and shows how their Gaia memory is meant to make you feel. And when we see Isaka’s plans for the Gaia memories, they can show that by just showing us Isaka with his shirt off, and see he’s covered in ports! Heck, the worst moments for the series are mostly connected to the CGI toys like the robot drones moving around on their own, because that’s when they lose their very real physical form and have to be replaced by animation. When you start making filming choices around physical objects, then, you start having to pay attention to and care about your blocking in a way animated stuff doesn’t. When you look at big scenes in more CGI-heavy live-action media you might be startled by how little anything there is there – because the CGI isn’t replacing a few things in the scene, the actor is being extracted from the scene to be swaddled in CGI. You don’t want anything in the foreground of that shot – you can just replace it digitally. This can be a problem for lighting (and is part of why a lot of CGI-heavy films like to do things at night, and why the vibrant brightness of stuff like Thor Ragnorok is such a big deal). 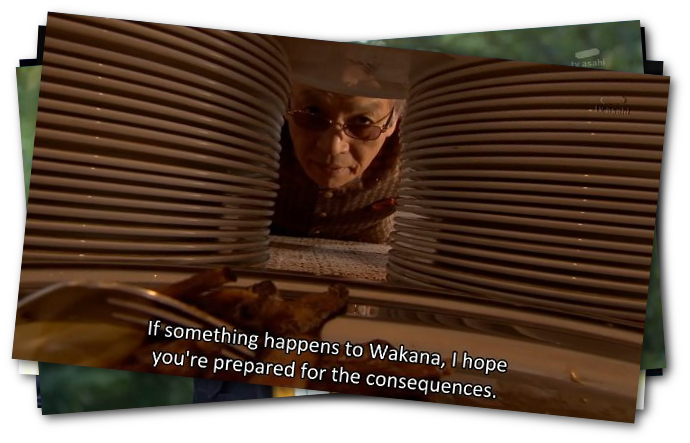 This brings us to one of my favourite things to point out in Kamen Rider W, the use of foreground framing. There are numerous times that the camera is positioned so there’s something in the foreground of the shot. This can sometimes make a shot more narrow, or it can hide something that’s going to come up, and it’s sometimes – but not always – used to highlight something. Kirihiko being shot behind a handrail that looks like bars, or Ryubee threatening someone through plates. These create an scene inside the scene. When you get down to it, none of these decisions or choices are particularly hard to make. But they’re decisions that you make when you’ve got a lot of practice. When you have to light a scene consistantly to stitch together the before-suit actor and the after-suit actor. When you’ve been making Kamen Rider fight scenes for near on seven to ten years, and the rubber suits are coming from people who learned how to make them from people who learned how to make them. Kamen Rider W is at its core a testimony to the excellence you can draw out of people who are merely given the opportunity to become very good at taking the process of creation seriously. It’s not just a well-structured and fun story – it’s also excellently crafted within its constraints of its budget.